Following successful completion of this course and achieving a minimum of 70% on the quiz you will receive a certificate for each completed section. Your certificate will be valid as long as you are employed by the County of Grande Prairie. Note: The items discussed in this training are meant to review the legislated requirements of trip inspections as set out by the Commercial Vehicle Safety Regulation. For more information refer to Alberta Regulation 121/2009. Pre-trips are a thorough check of a vehicle, trailer, and load prior to travel which is intended to ensure that a vehicle and its components are safe to operate and be on the road. Drivers are responsible for the vehicles they are working in. This includes preventative maintenance, conducting inspections, and completing written records as required. 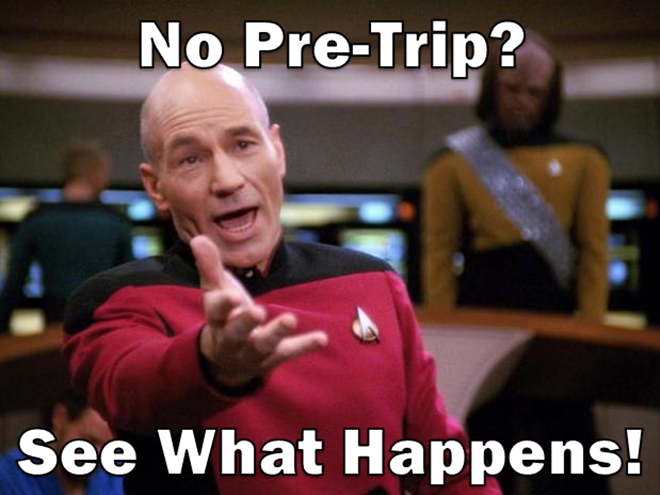 What happens if you fail to complete a pre-trip? 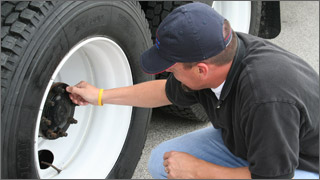 Pre-trip inspections must be completed and documented every 24 hours in which a vehicle is operated. Drivers are responsible for conducting and documenting pre-trip inspections and reporting any defects that are found. Carriers are responsible for ensuring that pre-trips have been documented and records are being kept as per the transportation legislation. In some circumstances, maintenance personnel may be responsible for conducting inspections. A pre-trip inspection must be completed prior to travel (no matter the duration) for every 24 hours in which the vehicle is being operated. If the maintenance crew is moving a vehicle from one location to another and a trip inspection hadn’t been completed within 24 hours, that person is responsible for completing the inspection. If a commercial vehicle is being used to transport equipment, goods, or passengers for the purpose of providing immediate relief in the case of an emergency, a pre-trip is not required prior to travel. Once the emergency has been resolved, the operator is required to conduct a pre-trip prior to travelling back to their home terminal. Example: the driver of a fire truck does not have to complete a pre-trip inspection before driving an engine to a structure fire. Once the fire has been resolved, the driver is required to conduct an inspection before returning to the station. A pre-trip inspection has the driver review and identify defects on any areas on the vehicle, trailer, or load as per NSC Standard 13, Part 2, Schedule 1. Ensure that the vehicle is parked in a safe, level location and secured from movement. You have familiarized yourself with the area and hazards that may be present. You are wearing the appropriate PPE. You have the appropriate paperwork to complete your inspection. As a commercial driver you are responsible for being aware of the difference between a minor and a major defect. No driver shall drive, and no person shall allow a driver to drive a vehicle that is not safe to be operated. A copy of the NSC Standard 13 can be found in the County's NSC Compliance Handbook and must be in all commercial vehicles. Have any additional equipment/supplies that are required. As you approach the vehicle have a broad look at the vehicle and area around it. 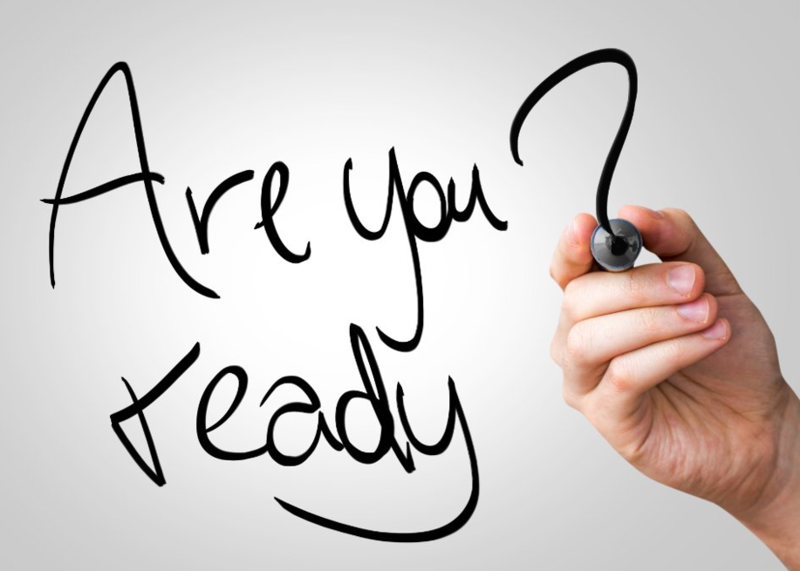 How long should your pre trip inspection take? 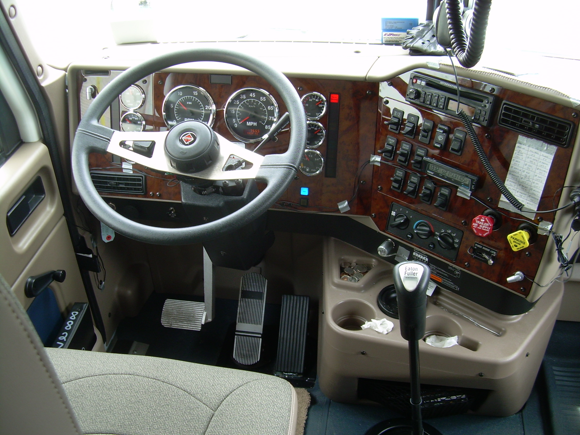 If done correctly, and you check all of the required components, a pre-trip should take between 30-50 minutes. Why is a Written Report Needed? If you didn't write it down, there is no guarantee that it happened. 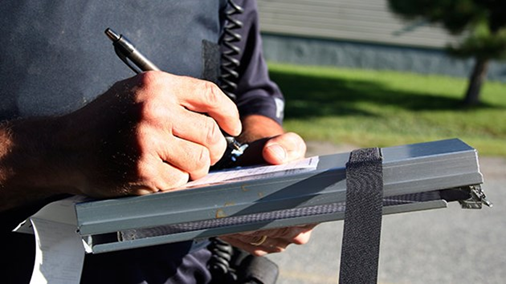 Written records of your inspections are vital to ensuring that you and the County are in compliance with the Alberta Traffic Safety legislation. Failure to complete trip inspections and associated written record may result in corrective action. This is an example of the vehicle inspection reports that the County uses. Remember: Vehicles presenting minor defects must be reported as defective as soon as the defect is discovered, and must be repaired by the next pre-trip inspection. Vehicles presenting major defects will remain out of service until the defects can be corrected. How do you complete the report? Minor defects must be reported and repaired prior to the next pre trip inspection (if repair is not done before the next inspection, the vehicle will be put out of service until repair can be made). Original reports must be carried inside the vehicle for a minimum of 24 hours and submitted to the County Shop within 20 days after it is created. After 24 hours the original report can be submitted to the County Shop and filed in the appropriate vehicle file. Talk to your supervisor/manager for more information for department specific practices for submitting your completed inspection reports. Yellow copies with reported defects must be attached to the associated work order showing that the repair has been completed. 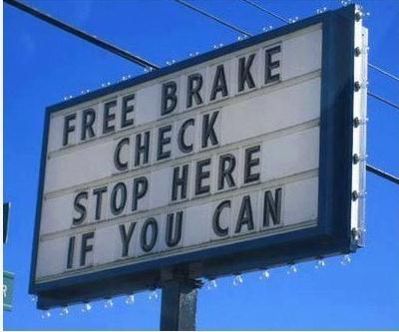 Note: Be sure to have the mechanic sign off on your original inspection report after repairs are completed and especially if you are driving the vehicle before the next inspection is due. We can be deducted marks on an NSC audit for unkempt paperwork – this includes excessively dirty inspection reports, time records, etc. 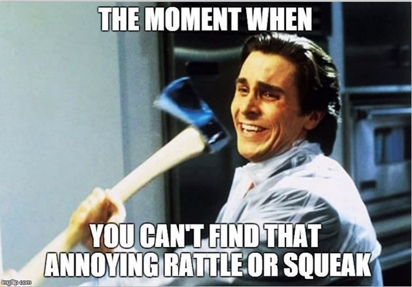 Please do your best to keep your paperwork organized, clean, and orderly. 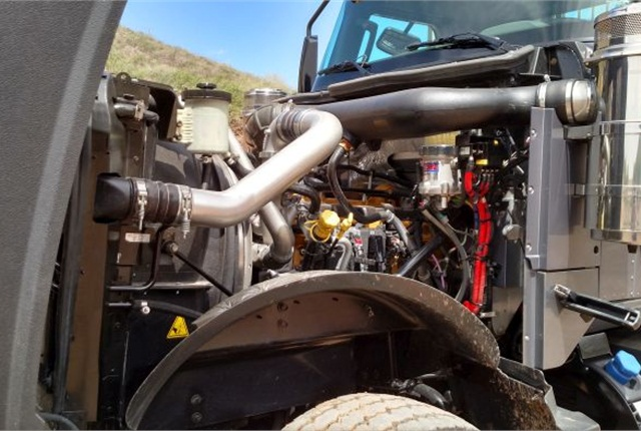 Ensure that the truck is fully fuelled and clean. Ensure that the truck is parked in an appropriate location with the doors and compartments locked. If your pre-trip wasn’t written down there's no proof that it happened - be sure to keep a written record. Do your pre-trip everyday before you leave your staging area. In the following slides you will be presented with 10 questions. Answer the question and click "submit". If correct, click "next" to proceed to the next question. If incorrect, attempt the question once more. If still unsuccessful, proceed to the next question. Upon completion of the course and a passing mark of at least 70% on the quiz, you will receive a certificate. If you are unsuccessful, you will be prompted by your supervisor to repeat the course. Once you have finished all 10 questions, click on "submit results". 1. What is the purpose of pre-trip inspections? 2. 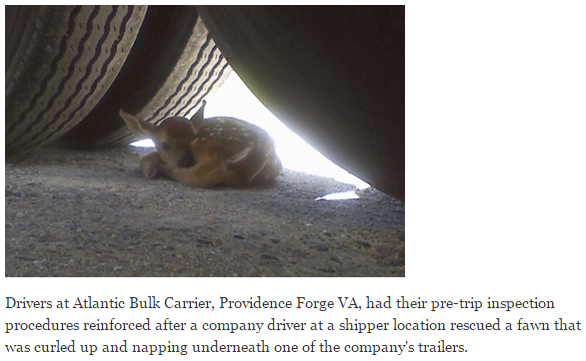 What happens when a major defect is discovered during a pre-trip? You can continue to drive but repair has to be made before the next pre-trip inspection or the vehicle will be put out of service. Notify the Shop or your supervisor and post the yellow copy of the inspection report to shop bulletin board under “defects” so repair can be arranged before the next shift. Nothing, as long as you don't get caught. The vehicle is put out of service until repair can be made. 3. How often must a pre-trip be completed? When you notice something is wrong with the vehicle. Every 24 hours in which a vehicle is being driven, no matter the duration in which it is driven. You are not required to do pre-trip inspections. 4. 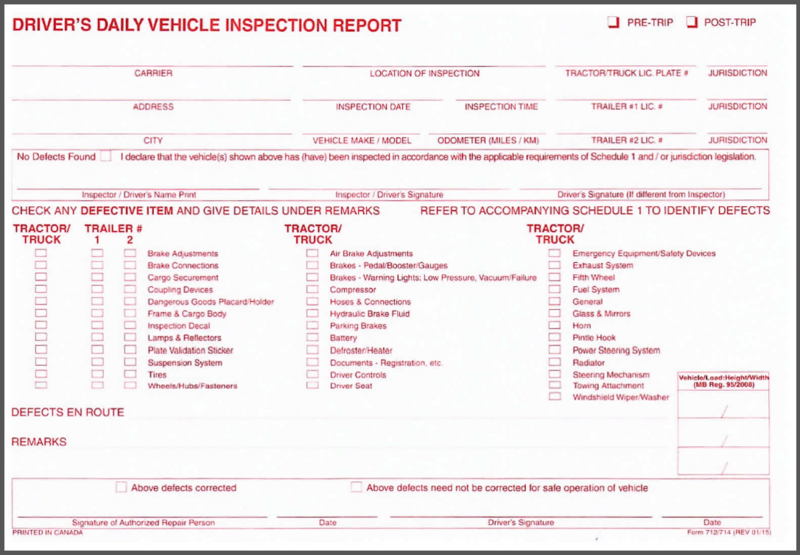 How often must the original pre-trip inspection reports be submitted to the County Shop? When driving a regulated vehicle, push rod stroke (brake adjustment) should be a part of the pre-trip inspection process. If you replace a headlight bulb you have to have the repair signed off by a licensed mechanic. Refer to NSC Standard 13 Part 2 Schedule 1 while completing this question. If a major defect is found you can drive the vehicle until you are able to schedule repair. 9. Where do you find Standard 13 Part 2 Schedule 1 (a list of major and minor defects)? 10. Which copy of the pre-trip inspection report must be attached to the work order or repair invoice once defects are discovered and have been repaired?